10 Tips for Planning Your Outdoor Kitchen - Fox Hollow Landscaping and Design, Inc.
Have you just purchased a new home? Are you looking to expand the outdoor space? If so, you may want to consider adding an outdoor kitchen. 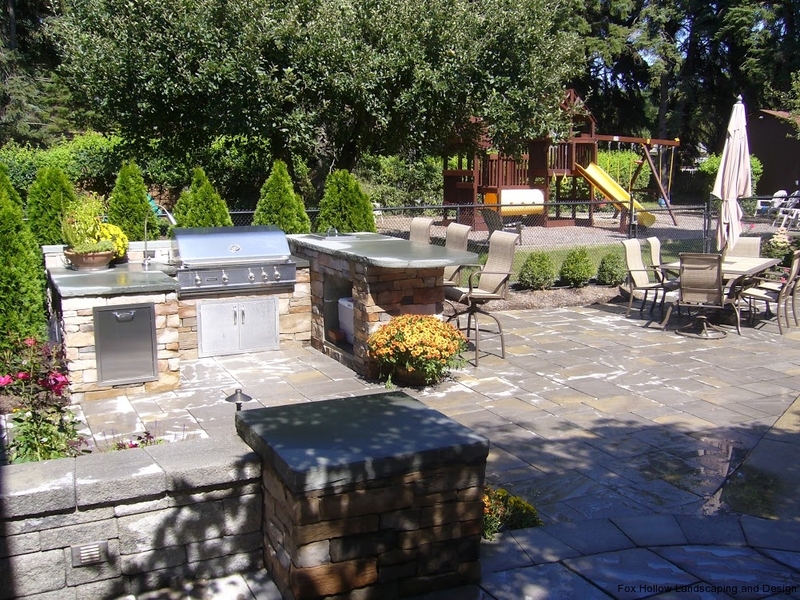 Outdoor kitchens are an excellent addition to any home, especially in the Northeast. You can enjoy them most of the year with barbecues, relaxed nights, and gatherings of family and friends. Continue reading to learn more about the best and easiest tips for planning your outdoor kitchen. One of the most common reasons outdoor kitchens are executed poorly is due to improper planning. You need to decide what you want, the size and flow of the kitchen, and then construct it accordingly. Make sure you have a proper budget for the entire project and make the kitchen a critical part of your outdoor renovation. Also, always try to stick to your plan. There may be unforeseen circumstances that cause projects to change, but if you keep altering the plan haphazardously, you may run into major issues in the future. If any changes do need to be made, look at the full scope of the project to ensure everything has been considered. One reason a massive project such as an outdoor remodel fails is that no one thought to hire a project manager. There are many things that need to be accounted for when planning an outdoor renovation such as the landscaping and how the outdoor kitchen will be properly incorporated. An outdoor kitchen remodel can be challenging and complicated. There needs to be communication between the homeowner, the appliance team, landscaping professional, builder, and anyone else that is assisting in completing the project. Project managers have the experience and insight to make sure all issues and questions are considered and addressed to make your outdoor space breathtaking. An important concept to remember when adding an outdoor kitchen is to blend it into the surroundings, so it does not look out of place. It may be tempting to go with a cheaper alternative, but the end product will show differences that will be quickly picked apart. Try to use the same trim and stone that are used in the landscaping as well as your house for maximum appeal. One of the things you need to consider when planning your outdoor kitchen is the amount of light that will be required. If you have a late dinner and there is no sunlight left, how will you see to cook the food? But also consider that light attracts insects at night. Make sure to add in a dimmer or lower light option to be able to see and cook, but not get eaten alive! House to outdoor space proportions must be kept in mind for both large or small homes. If you plan for an outdoor kitchen and make it too small for the size of your home, it is going to look unusual and odd. If you have a small house and choose a large sized outdoor kitchen that too will look unexpected. Add in structural elements that can assist with the size and proportion you are going for. These include items such as plants, screens, and water features. One of the reasons you want an outdoor kitchen is to be able to cook all the things that you cannot cook inside due to the smell, smoke, high heat, or long cook times. Outdoor kitchens are much more suited to sear meat over high heat, smoke brisket, or cook an item in a hot oven; things you would not want to do in the indoor kitchen of your home. Keep in mind what you plan on cooking in this space; that way you can avoid purchasing appliances you will rarely use and prevent you from having to renovate a second time to add forgotten elements. On the other hand, you can do so much more with an outdoor kitchen then just cooking. Know what you want to use your area for in addition to an outdoor kitchen. 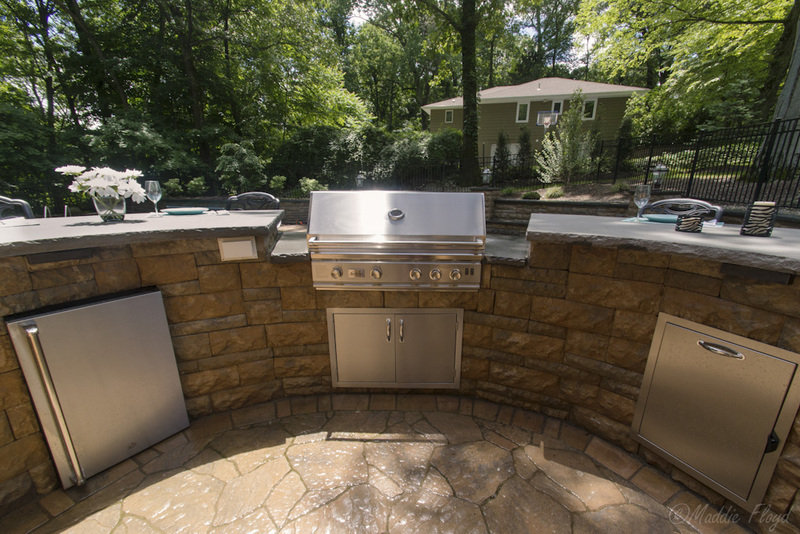 Your outdoor kitchen is more about outdoor living. Do you want to have a big screen TV on with the big game and a few friends over? Do you want to add in an outdoor heater for the winter to sit outside and look at the stars on a clear night? It is all up to you on what you would like for your living space. When planning your outdoor living space, focus on creating the proper amount of flow. You do not want pool goers to have to walk by a hot grill to get a drink. Flow refers to where each item should be located to get the best function out of it, and it will be different for each customer, so make sure it is tailored specifically to your needs. If you have many gadgets in the indoor kitchen, you do not need to bring them into the outdoor kitchen as well. An outdoor dishwasher, wine fridge, warming drawer, or other non-essentials might be slightly overdoing it. It depends on how much you want to spend as well as how often you will be using the item. If you feel that it will be something you will frequently use, then by all means plan for it. What Are The Main Points When Planning My Outdoor Kitchen? 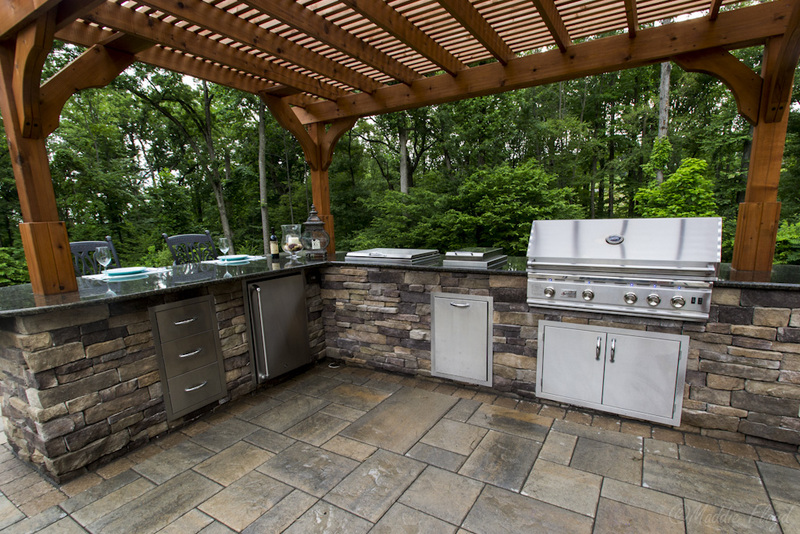 An outdoor kitchen is an excellent addition to any backyard. 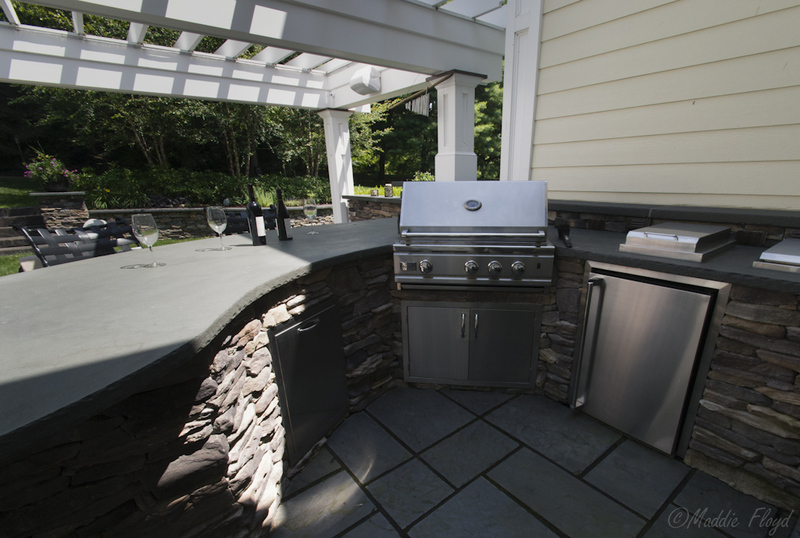 To move forward with your outdoor kitchen, you need to make a plan and stick to it. Hiring a project manager will save you in the end. Make sure your new kitchen matches the style of your existing home and landscaping. You want a lot of light in the new kitchen as well as a proper amount of size and flow. Know what you are going to use the space for, in addition to cooking. Lastly, do not overdo the space – less is more! If you need assistance with any of your outdoor projects or landscaping, make sure to contact Fox Hollow Landscaping & Design for all your landscaping and project needs.